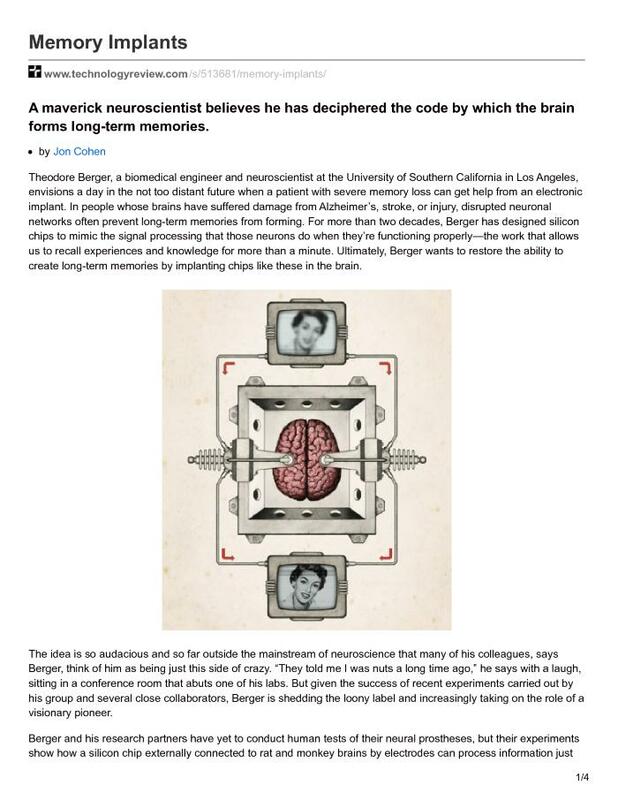 Decimal Lab : Text : Memory Implants: a maverick neuroscientist believes he has deciphered the code by which the brain forms long-term memories. Theodore Berger, a biomedical engineer and neuroscientist at the University of Southern California in Los Angeles, envisions a day in the not too distant future when a patient with severe memory loss can get help from an electronic implant. In people whose brains have suffered damage from Alzheimer’s, stroke, or injury, disrupted neuronal networks often prevent long-term memories from forming. For more than two decades, Berger has designed silicon chips to mimic the signal processing that those neurons do when they’re functioning properly—the work that allows us to recall experiences and knowledge for more than a minute. Ultimately, Berger wants to restore the ability to create long-term memories by implanting chips like these in the brain.